Bullish Possibility: We are going through a bullish consolidation and markets are poised to go higher; this possibility is very much on the cards as long as 5280 holds on downside in Daily / Weekly charts. 2 consecutive closes below 5280 negates the bullish view. Bearish Possibility: A top is in place and the last leg of correction has started [This is a major correction to the Jan '08 top of 6357 and Nov '10 top of 6338]. If this is correct then downside targets are 4373-4531-4693-4770 over the next 6 months. 2 consecutive closes above 6280 negates this view. Im leaning towards the bearish possibility for now but will change gears as soon as the possibility is negated. This is definitely not the time to enter long positions on delivery basis IMHO but actually the time to book profits and conserve cash. There is excessive optimism in the global equities scenario and usually markets lean in the direction opposite to the majority. With money printing rampant from all major central banks, its quite clear why markets are so buoyant. 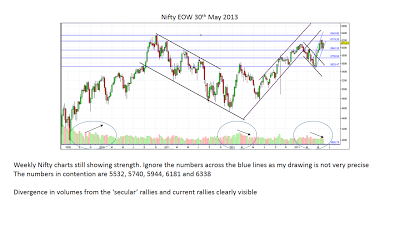 From an Indian market perspective, its true that all the secular bull market rallies so far have taken place when the Rollar was below 48.25 This also points towards a major divergence; with Rollar at 56+, its more prudent for hot money to pour some more money into the Indian stock markets for now. 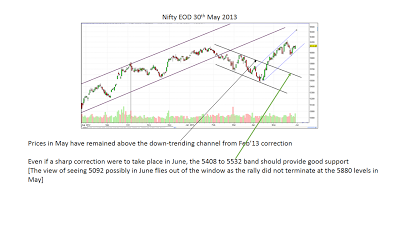 Both the Nifty and Rollar are due for a correction. 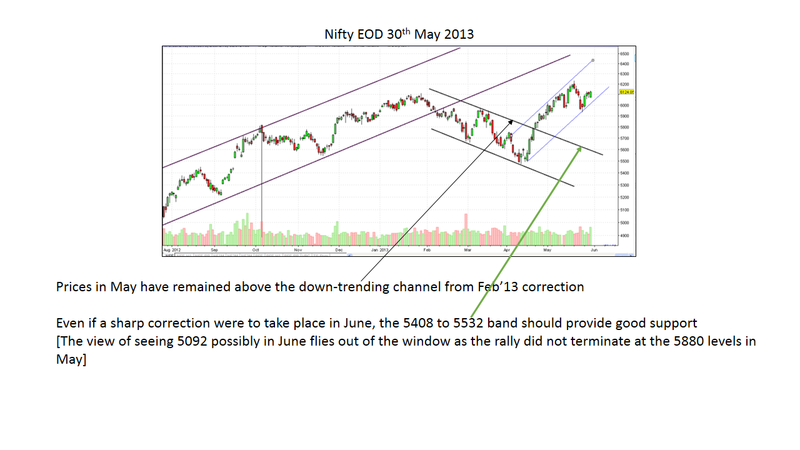 The most likely outcome in the near term to begin with is a 10% correction on both Nifty and Rollar. Should that happen, FIIs are hedged completely in dollar terms as their dollars will remain intact in such a scenario! Its very clear looking at Nifty and other sectoral indices that its not a broad market rally [The last 2 times when such a rally took place, even duds like Suzlon, Rpower, RCom or for that matter Sintex, Patel Engineering etc etc were all rallying which is the sign of a secular bull market] We have seen good sectoral churning right now and once it was FMCG, then IT and now the Auto and Pharma space. At the end, its all about maintaining the index. 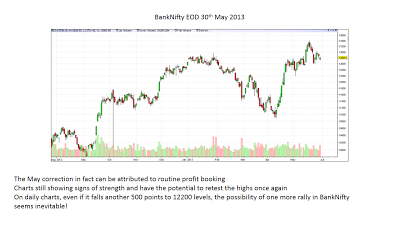 BankNifty saw additions in counters as well. Its difficult to catch tops and bottoms and with sectoral churns happening, one is best protected by keeping exposure to the index as that automatically relieves the burden of diversification. 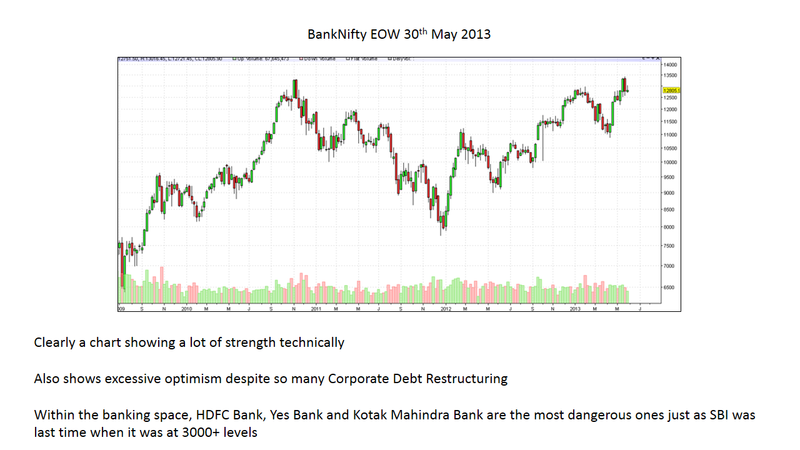 Yes the returns may not be high but the risks are also covered well. A secular bull market in India IMHO is only possible after the elections. 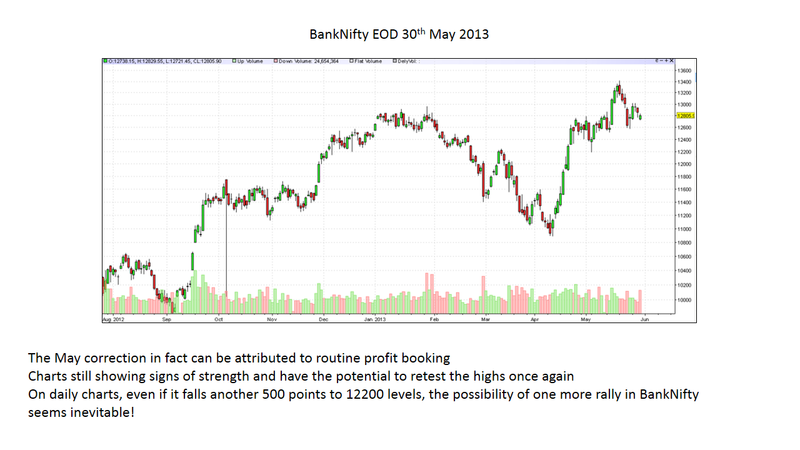 June will be a high octane month for trading with lots of opportunities on both upside and downside. The most critical date is 21st June and in the 5-7 trading sessions before and after 21st June, alert traders may stand to gain a lot in either direction of Nifty. The most critical numbers to watch out for on Nifty are 5944 and 5740 on downside and 6280 on upside. 2 consecutive closes below 5944 opens Nifty for retest of 5740 and 2 consecutive closes below 5740 opens Nifty for retest of 5408-5532 band. On upside, 2 consecutive closes above 6280 opens for bull fireworks on the index. 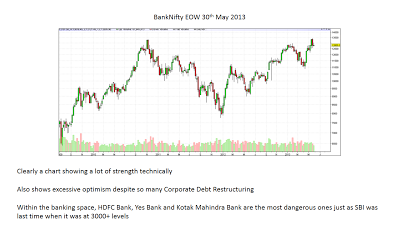 What is important to note is that even in May expiry week, we did not get a close below 6080. We have not had a weekly close below 5944 in the last 3 weeks. That does not take away the merit of EW Analysis; the concept per say is excellent and indeed helps identify turning points. The biggest problem with the current team of EW pundits including Bob Prechter is that they are excessively biased towards their own trading positions [if any] The moment any analyst using any technique puts in his/her own bias for analysis and trade, that analysis/trade is most often than not wrong. So lets just learn to use the techniques and study the charts and prices objectively. The EW team is still looking at deflation [which as per most dictionaries is contraction in credit] On one side they will give you books titled 'Stock Market is Not Physics', Conquer The Crash' and on the other side they will continue to look at doctored CPI numbers only to find stock markets roaring to new highs. The latest articles point towards gold at USD 500 per ounce because in the 100 years of Fed's existence, gold appreciated 4 times that of CPI inflation!!! There is no impact of change in economical dynamics over the last 100 years!!! And the very same pundits point to the Dow-Gold ratio i.e. purchasing power of the dollar that has gone down by almost 95% and that is NOT INFLATION!!!! Inference: Use the techniques and apply your own mind and devise a strategy for your trading / investing success. Now coming to the likes of Roubini, Fergusson [from the Ascent of Money fame] and Krugman, et all that they are doing everything they can to cut costs and are questioning their own analysis for nothing justifies the current rise in global stock market indices and Euro-zone still seems to be going strong. Its almost 5 years now from the time these rallies began. The downside targets for global indices remain intact and it is only a matter of time. News will come after the price events take place. Corrections will come and they will be hard when they come through. You will find the video updates uploaded below over the weekend.